Afternoon Picnic in the Park, March 18. Different displays throughout the year. Historic House Tour. Events at the historic Pritchard House throughout the year. Windover Dig Exhibit and lecture. History of what was there before KSC and at present. They just celebrated 50 years last year. History of people who occupied the area including Ais Indians, etc. History of Space highlighting special events and exhibits throughout the year. Feature each business and what it was originally. Street parties with celebration themes. Maps and document displays, historic photos in City Hall and Welcome Center. Opening of Time Capsule & Mayor's Proclamation (proposed in January Friday Live Event). Contest for what should be put back into the time capsule during the year and refilling it for future (time TBD). Hold special services with church history and tributes to pioneers and leaders of community. March Air Show and Exhibits/Events throughout year. History of Planes, pilots. Can hold lectures/displays about historic events and/or people. Can help with City Tours throughout year. (I have scripts written about each building. Humanities class helped do it before). Maybe do some vaudeville or silent movies. Art contest depicting historical events over the past 150 years. 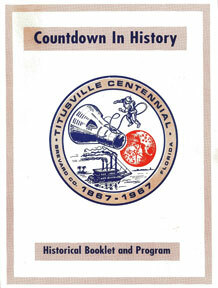 Write stories about Titusville history, people, events. Interview and write stories about their grandparents or older relatives who grew up in Titusville. 150th Committee will choose best ones to put back into time capsule. Want to see what we did 50 years ago?